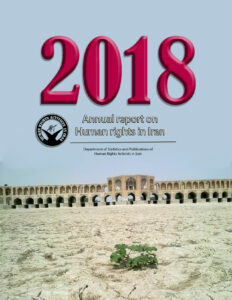 This leaflet contains the 2018’s analytical and statistical annual report on the human rights in Iran, prepared by the Department of Statistics and Publications of Human Rights Activists in Iran (HRAI). This statistic analysis report presented by HRAI, is the result of the daily efforts of this organization and its dedicated members as part of a daily statistic and census project that started in 2009 by this organization. This annual report on human rights violations in Iran (2018) is the collection, analysis, and documentation of 3677 reports concerning human rights, gathered from various news sources during 2018. Human Rights Activists News Agency (HRANA) has gathered and reported 35%, official or close to the Iranian government sources 58% and other human rights news agencies 7% of all the reports analysed in this Annual Report. The following 42-pages includes statistical overviews and related charts on various sections regarding women’s rights, children’s rights, prisoners’ rights, etc. 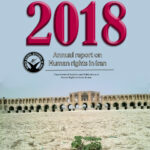 Based on this report, despite the 6% increase in human rights violations reports in provinces other than Tehran, compared to the last year’s annual report, there is still a major concern on lack of proper reporting and monitoring of the human rights by the civil society in the smaller cities. This report is the result of endeavors made by courageous human rights activists in Iran who pay a very high cost for the realization of their humanitarian believes. However, for obvious reasons (i.e. existing governmental limitations and ban on the free exchange of information and government preventing the existence of human right organizations in the country), this report by no means is free of errors and cannot alone be a reflection on the actual status of human right in Iran. Having said that, it should be emphasized that this report is considered as one of the most accurate, comprehensive, and authentic reports on the human rights conditions in Iran and it can serve as a very informative source of information for human rights activists and organizations working on Iran, to better understand the challenges and opportunities that they may face.